Hillsong United – ‘Let Hope Rise’ – Taya Smith’s NWO T-Shirt and Transformer Sinister Imagery – Coercion Code – "Dark Times are upon us"
World-renowned worship band Hillsong UNITED was on set of the Today show Wednesday morning to promote their highly-anticipated feature film, “Hillsong-Let Hope Rise.” The film will chronicle the spectacular rise of the prominent Australia-based band. (Photo:GRACE HILL MEDIA)“Hillsong-Let Hope Rise” hits theaters nationwide September 16, 2016. “Hillsong-Let Hope Rise” is a Pure Flix film that will chronicle the spectacular rise of the prominent Australia-based band, Hillsong UNITED. In the film’s trailer, Senior Pastor Brian Houston explains the start of Hillsong and his heart for their music. Various clips of the band praying, touring, writing songs and more are highlighted. “In the end our success is not about us, it’s all about God. You take Him out of the equation, you got nothing,” Houston says as UNITED’s hit song “Oceans” plays in the background. “Hillsong-Let Hope Rise” was directed by Michael John Warren, who is also behind the popular Jay Z film “Fade to Black.” The cinematic release will take viewers on Hillsong’s journey, which started in a tiny church in the Sydney suburbs to an influential international ministry whose songs are sung every Sunday by more than 50 million people across the globe. Their songs are recognized all over the world and have been translated into 60 languages. They sold more than 17 million albums. Hillsong has grown from a single church in suburban Sydney to an international ministry that now extends to cities on five continents, including London, Paris, Sao Paulo, Capetown, Rio de Janeiro, and Phoenix. In America, Hillsong is recognized for their thriving congregations in New York and Los Angeles. Combined, the ministry reaches over 100,000 people weekly. In addition to its local church initiatives, Hillsong just recently launched their own channel on TBN and frequently partners with international organizations to help provide food and education for children in the slums of India, building housing for those living with AIDS in Africa, and rescuing victims of human trafficking around the globe. “Hillsong-Let Hope Rise” hits theaters nationwide on Sept. 16. 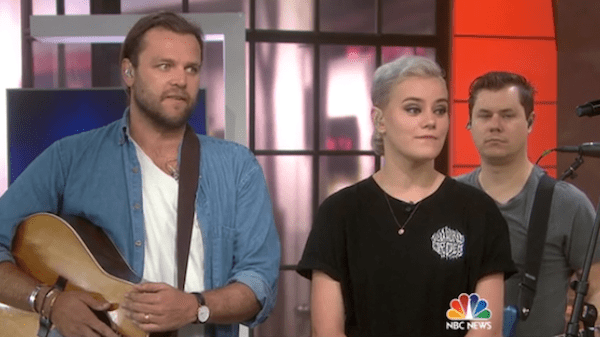 I have grave concerns when I see a robot transformer in their poster, and I see their lead singer Taya Smith wearing a T Shirt with ‘New World Order’ . I appreciate what you are saying.I know it seems like I’m tearing them down, but these two aspects cannot co-exist. Their good cannot outweigh the bad. 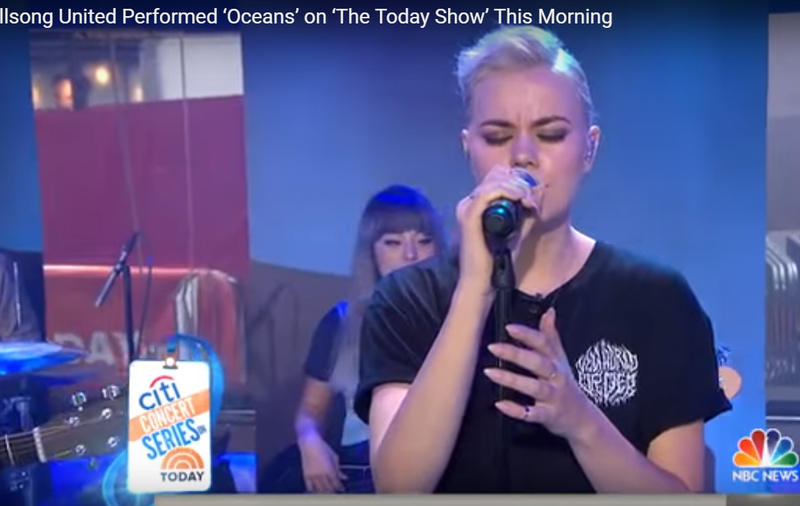 Why is Taya Smith wearing a shirt that does NOT glorify God.Its a direct reference to this world, and the Elite’s plan to subjegate and destroy this world. Winning the lost is more than playing music all across the globe…. I know what I believe do you? Taya Smith is part of a corrupt system. She is caught up with leaders who have lost their discernment. The issue is not whether I am a fraud, but what is Taya doing on National TV wearing this T shirt? This would be no different from her wearing a top that shows off her tummy or she did the ‘diablo’ hand sign in front of the cameras. The issue i have expressed is more than obvious. Obviously being in the public eye she is open to this criticism. She has not offended me personally, but the name of Christ. How do I know? Is Taya saved? The first question is was she actually born again? Then from there is she walking in that reality? Where have I claimed she has lost it? Salvation in Christ can be very fragile. Take Judas Iscariot. 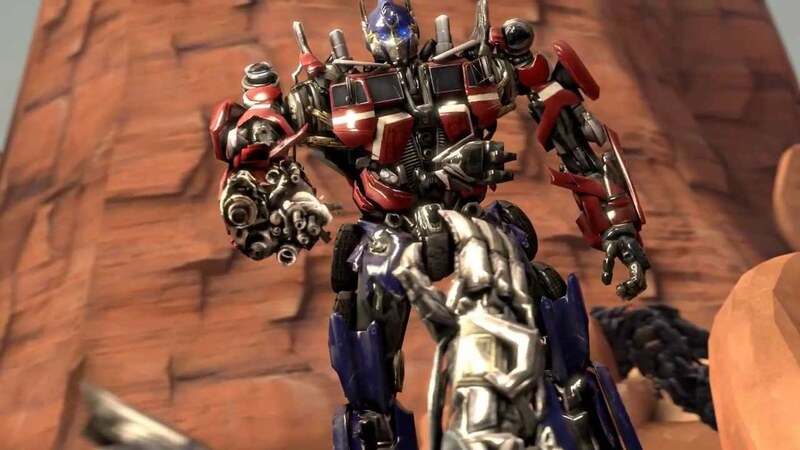 He was a follower, but never let the truth impact him. Salvation is of God, and is through the power of God, not works. In conclusion, that salvation begins, and we go on being saved. Saved from the temptation of sin, from the corruption of sin, and the desire for sin. I never take salvation for granted. Yes….once saved always saved, but not in any loose sense. I thunk we are way off topic. Yours was not a question but your own statement that Judas was never saved. While I agree , the matter of salvation is one of great complexity, even in the case of Judas. Did he not walk with Jesus? Was he not trusted with the money? Did he not cast out demons and heal the sick like the other disciples? And he had Jesus ‘ presence and Jesus’ teaching and instruction but never seemed to allow it to influence and shape his life. The point is many Christians are followers of Jesus, but are not applying what they know, and have learnt. Sorry, but the fact that I have criticised them over this issue indicates that we will not agree on their music. Read the article through again (or for the first time). I can fault it, because salvation is not a rubber stamp in a passport. More than that it is a mystery at times beyond our comprehension, and certainly beyond our puny simplistic theology. Now Timothy is making out he’s Taya or speaking for Taya? I am going to post your stupidity. Because my article is not an an attack on Taya. He voice or ability has nothing to do with it. She is an ambassador or representative of Christ before the world, and yet she is wearing this very concerning, in fact an Anti christ styled T Shirt. But lets just stoop to name calling. I really don’t think we should judge what she’s wearing..obviously we’re not going to judge what you’re wearing. Just be glad she’s wearing something. The brand/logo the UNITED members wear are TPVS. Also, instead of bringing her to the internet world and slamming her here, you should actually reach out to her. It’s more appropriate that way. However I should be glad she’s wearing something? Should I be happy she believe’s something? Should I be happy she sings something? None of these categories are sufficient for a Christian in the true sense of the term. A true christian in a public role must be above reproach. But most don’t like this, and always combat such criticism by quoting the 11th Commandment….thou shall not criticize. I will burn in hell if i don’t repent, and continue in a life of repentance and faith in Jesus Christ. Wow! Very patient of you Lance. The devil is attacking you here. Amazing how many ‘Christians’ say don’t judge!! They don’t know or understand the bible.